The relay warm-up with passing incorporates dribbling, passing, and dynamic locomotions to get players sharp on the ball and ready to go. Set up relay lines with cones 10-12 yards apart. Form even teams and have each team start at the first cone of their relay line. The first player in line dribbles down to the cone across from them and then passes to the next player in line before running back. Coaches can also have players perform different locomotions to the end of the line on their way back. Be sure that players are using the inside of their feet to trap and pass the soccer balls. 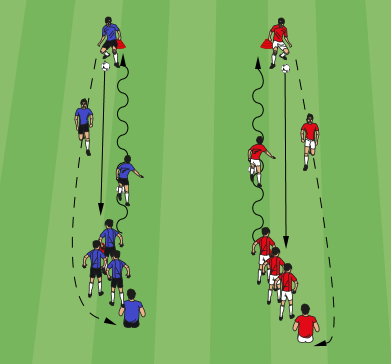 For more advanced groups, coaches can have players pass with their weak foot only. Have players work on communication by calling out teammates names before passing or calling for the ball before receiving.